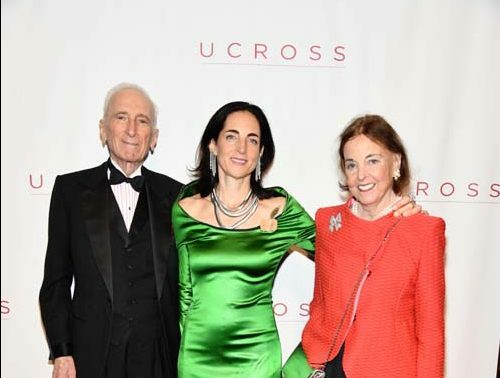 The Ucross Foundation hosted its inaugural New York Gala & Awards Dinner last night at The Appel Room at Jazz at Lincoln Center. The night was filled with performances and readings by notable award-winning artists, all Ucross alumni, including Ricky Ian Gordon (Grapes of Wrath, opera), Steven Lutvak (A Gentleman’s Guide to Love and Murder), bestselling author Tayari Jones, author and Vanity Fair contributor Elissa Schappell, composer/pianist Dylan Mattingly, trumpeter Frank London, and singer-songwriter Kate Schutt. Special guests included Broadway stars Laura Benanti and Nancy Anderson. A collection of artwork from Ucross visual artist alumni was on display and available for purchase. The emcee was former journalist and current film and television screenwriter William “Bill” Broyles. The evening began with a cocktail hour featuring a visual arts exhibit and sale by Ucross alumni. One of the paintings, by artist Pamela Talese, was presented as a gift to philanthropists Jesse and Cathy Marion, who received the Outstanding Patron of the Arts Award. All the works in the exhibit may be viewed here. Philip Himberg, Artistic Director of the Sundance Institute Theatre Program was also honored last night with the Outstanding Creative Partnership Award for his years of collaboration with Ucross. Photo credit: Jared Siskin/PMC via Getty Images.